In short, there is no democracy without citizens and there are no citizens without democracy. Therefore, I propose the following: beyond what is written on posters, or in platforms and said in debates, a party will be considered as a citizen-party if, and only if, it allows citizens to play their role as citizens. In Athens, every citizen which so wanted could initiate a legislative bill or a proposal for a decree. This principle of “ho boulomenos”, usually translated as “the first comer”, constituted in fact the essential property of the Athenian democracy. This corresponds to the principle of “isègoria” – the equality of all in speaking in front of the assembly. Democracy presumed that there is no need of specific competence for decision-making. A citizen party will therefore have to allow a maximum of possibilities for citizens to propose things and to participate in decision-making. And not only on incidental subjects. The ideas of collective intelligence and of everyday know-how were always part of democracy. Aristotle reminds his readers that a person who lives in a house knows it better than the person who builds it. The American philosopher John Dewey made the same point saying that he who wears a shoe knows best if it aches him, even if the cobbler is one who is best equipped to fix it. Kant defined the citizen as a “co-legislator”. In short, “a citizen party” will be a party that will bet on the decision-making capacity of the citizens. The party that will make the citizens into co-legislators. John Stuart Mill, one of the fathers of liberalism, defended the idea of “citizen juries” being “a practical part of the political education of the free people”. At a time when there is much talk about “a citizenship course”, a citizen party will be a party which aims for a maximum number of ways for teaching citizenship through its exercise. It is well understood that this contradicts the very idea of professionalization of politics. Our Athenian ancestors were very wary of people becoming established in their positions. In addition to preventing abuse of power, the goal was to have each one alternate in being ruler and being ruled. Mandates must therefore be short and successive terms to the same position must be disallowed. One of the foundations of Athenian democracy is rotation which permits a maximum of citizens, in turns, to assume political office. 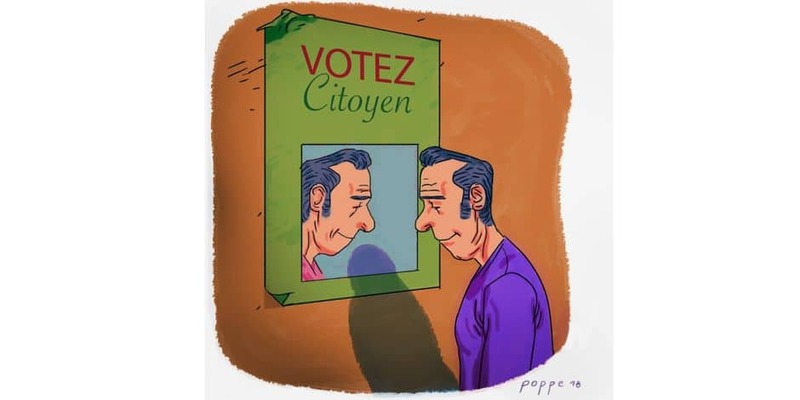 Therefore, a citizen list cannot merely open “a few” positions to citizens (as “political newcomers”), within a large majority of old political hands with decades of experience. And as sortition was the main way principle to assure rotation in Athens, a citizen party will be a party that will leave a significant role to sortition being that of creating its list of candidates or for selection into the citizen organs that it proposes to create: commissions, committees, participative workshops, etc. Furthermore, it will have to plan for a way for the citizens to recall elected officials who do not fulfill their public function. That would mean that the elected would be held to account during their term with full transparency and that the citizens would be able at any moment to propose a vote of censure, leading to, when necessary and as was the case in Athens, to the immediate discharge of the official. To summarize, we would consider as a “citizen party” or “citizen list”, a party or list which allows us to be citizens, in offering us the greatest opportunity to participate in the management of the city-state, be it through community councils, parliaments, commissions, committees, popular juries, initiatives, referenda, urban workshops, or any other mechanism or organ, allowing us to propose, deliberate and govern… and being particularly attentive to the budgets that these parties would propose to allocate to this participation. Great article. Especially with the coming communal elections in France. Thanks for the translation, Yoram. There is nothing to disagree with this article. Needless to say, the devil is in the detail which need careful consideration as here in Vienna, we are currently approaching the re-lauch of G!LT 2.0, a “real” citizen party by Yves’s criteria, for the upcoming Vienna elections. I sense a growing notion in this blog, that elections – hence a citizen party – is the most predictable way to get within our lifetimes from the current oligarchic party system to a democratic system which the audience here might like. I can share the new website after launch with some explanations of some of these considerations, if it is of interest here. Not least, how to win such elections, actually. The skepticism of the article in the intents of party elites is, of course, quite justified, and the term “citizenwashing” is useful and entertaining. However, I think that the article reflects a misguided, and rather common, belief in the value of mass participation. Mass participation is in fact inherently unequal and therefore inherently undemocratic. It gives the illusion of power without real power. An exhortation for allowing a “maximum of possibilities for citizens to propose things and to participate in decision-making” sounds very egalitarian and democratic but in reality leads to the creation of elites who control decision making while most citizens waste their energies, and become frustrated as elite-determined policy is pursued that does not reflect their interests and values. It turns out that democracy in a large group is far from being a naturally occurring phenomenon that could bloom into being as soon as artificial barriers are removes. Analysis, as well as experience, show that democracy cannot be built upon mass participation. This is not due to the shortcomings of the average citizen or to the great faculties of elites. Rather it is an inherent property of large groups. It is unfortunate that mass participation has such a strong superficial appeal that it never ceases to charm reformers. No – democratic reform must utilize sortition in a very deliberate and disciplined way, not with sort of a happy-go-lucky, let’s-try-and-see, give-everything-a-chance, laissez-faire, wishful-thinking attitude. The latter is a recipe for failure, frustration, and the concomitant politics of rage and hatred, the seeds of which we are witnessing today. 1. Negative — The masses weigh in each and every topic – that seems to be your thinking in your post. And clearly, it brings Elias Canetti’s negative mass power at its worst, a dumb mob steered by primitive emotions, reactions of the “Id”. Since Kahneman some call it “System 1”. 2. Positive — The masses participate by dividing the labour of social rule development, public appointment and democratic control, which is G!LT's proposal. I understand Yves's article in this vein. Such divided groups must be representative for the citizenry and group sizes must allow reason to emerge and prevail. This produces F.A. Hayek's positive use of knowledge in society, powered by the collective intelligence of the "Über-ich". Can you elaborate on how the system you propose would work? Presumably, if there are many groups there would be many policy proposals. There would have to be some way to decide between those proposals. How would that work? Our G!LT process has two stages: (1) a screening process where reasonably representative Bayesian votes from the open public decide by action standard constructs which ideas (which may be policy proposals) get to go in front of a citizen parliament (jury) who (2) then decide about acceptance or rejection by systemic voting. Note: “Mass participation” brings the benefit of a near limitless number of citizen parliaments (compared to the one single parliament today) hence there is much more band width for deliberated decisions. So it is mass participation because there are many different decisions to be made and each jury makes one decision? And who decides what decision each jury makes? And who is in charge of execution? And won’t some decisions be much more important than others? And how long are the jury terms? 1. Kind of, not necessarily one “decision”, but you get the idea. 2. A modern-day Kleroterion, as you may have guessed. 3. The relevant jury decides who is in charge (part of a decision). 5. Depends on the topic. I hope the website will flesh out your proposals in much more detail. Could we depend on you to provide an English translation and post it for discussion on Equality-by-Lot? 2. Randomization can decide who to assign to a jury, but it cannot frame the decision to be made. Who will do that? Would that same authority also decide on the length of the jury service? Whoever makes those decisions would have a lot of influence over policy outcomes. 3. So presumably there will be professionals who will be in charge of execution? Who will monitor them? Won’t they be the ones who have real power? 4. So for most people their “participation” will be symbolic (“political breadcrumbs” as Patte so nicely puts it above), while for a few there will be meaningful, hugely influential decisions (assuming it is not the professionals who are actually in charge). In general, it seems that the whole system would need to be managed by professionals. And it seems highly likely that those professionals will carry significant political power and become the real rulers. Again – it seems there is a risk (or inevitability) of the popular participation becoming an illusion of power without real power. “Austrians” are obsessed with scientific procedure. Now, if the procedure is good, it will deliver as much neutrality as humanly possible. If it fails to do so, we improve the procedure. 2. There is only one frame: the proposal as proposed by the idea owner, which proposal must pass the (sortitioned) public’s preselection. So the ones who have real power is that part of the public. 3. It’s systems and people working to procedure. A separate group (“Methodic”) monitors that the unified procedure is observed by the “Moderator” group. 4. Well, luck of the draw. We are all Kleroterians here, aren’t we? And no, those managing the would have zero political power, as it is one and the same neutral procedure applicable mutatis mutandis for any topic. So it turns out there is an initial phase where proposals are made by the public and evaluated by evaluation juries. How does that work? I don’t think there can be a generic neutral working procedure that may be applied without discretion (i.e., without political power). The notion of a bureaucratic apparatus that carries out decisions mechanically is unrealistic. Neither an “evaluation jury” nor a “burocratic apparatus”. It is a systemic democratic rating process using generic action standard constructs. Definitely realistic, that’s how corporate clients already do idea vetting by crowd intelligence all the time. It will work with a public crowd of citizens just as well as it works with internal ones of employees or consumers. I think where we differ is that I believe that a general process and rule-set is possible, if developed (and execution monitored) by people interested primarily in devising a generalised & neutral standard process. Since you think that there are existing organizations that are models for what you are proposing, can you provide examples and specify what is the objective measure that indicates that they indeed achieve the goals you expect of them? G!LT certainly exists and we will announce our new website shortly. So bear with us. And thanks for your questions. I will add them to our checklist. I was referring to the “corporate clients [that] already do idea vetting by crowd intelligence all the time”. But in the political sphere, we already did a first open “citizen part” trial last year and it worked perfectly fine, as was to be expected. It has not been documented scientifically (yet … lack of time/volunteers) but the source documents are all online. I hope this helps. Due to G!LT’s unconditional prior acceptance of the deliberated citizen parliament decision, I would argue that G!LT fulfils all stated criteria for a “true” citizen party. I can’t say I understand the procedure you are describing. As for the objective outcome measure, what I was thinking about was some sort of an objective indication that the outcome of the process is indeed democratic. Merely making decisions by majority vote is, of course, not sufficient since that does not address the crucial questions of how the agenda for the vote was set up and how well informed the voters were when they cast their votes. 1. A decision is “democratic” is if it expresses the General Will, no more, no less. Citizen parliament decisions are falsifiable through objective public referendum results. 2. Majority vote is problematic, as it suppresses minorities, G!LT uses systemic voting. 3. The citizens set up the agenda. Can you provide a link to an English explanation of G!LT voting? Which citizens might that be out of the many millions on the electoral roll? Presumably you are referring to the tiny number in the (citizen) “parliament”. However the term (as you know) is derived from the Old French parler and the speech acts of a tiny group of citizens cannot benefit from the law of large numbers, so have no democratic legitimacy (absent a very large number of referenda). @Terry: Quite busy, sorry, but one of our videos an the new site will be subtilted in English. @Keith: You misunderstand. Not the citizen parliament. Triage of proposals (preliminary voting for ranking purposes) can be done by a sociodemographically representative random citizen sample. And that’s perfectly democratic, any statistical error being way smaller than the likely cognitive error magnitude. @Terry: … anyway, the basic principle is always the same. Decision is not by majority of Yes votes, but by the smallest number of No votes, in a vote space of at least 3: Yes. Can live with it, No. > The citizens set up the agenda. What does this mean? What is the procedure? Say there are a thousand proposals a day (a conservative estimate in a country of millions). How is this stream of proposals handled in a way that is substantive rather than determined by non-substantive considerations such as advertising and prestige? HJH:> Triage of proposals (preliminary voting for ranking purposes) can be done by a sociodemographically representative random citizen sample. If, as Yoram points out, there are a large number of proposals then the triage will be rationally ignorant and/or subject to heuristics based on advertising and prestige. Although votation is subject to the same constraints, at least everybody gets to choose. In combination with quite a high number of possible parallel citizen parliaments, it is unlikely that a good proposal will get lost. We believe that the citizen parliaments – which decide on triaged proposls – will be far less manipulable than referenda, not to mention politicians in power. Whilst your model may have epistemic value, Dahl insists that democracy requires agenda setting on majoritarian lines. It’s not sufficient to claim that the agenda of demarchic committees can be overturned by popular referendum. 1. Nothing wrong with Dahl there. 2. In addition, please consider that ever since the advent of modern probabilistic methods as proposed by Richard Mises here in Vienna we know that we can establish “majoritarian lines” with a much smaller sample. is very specifically that it is a method for its falsification, with the expected probability of the a priori confidence level (ignoring for simplicity the error potential of each method). This is very different to “overturning” a demarchic decision. HJH:> 1. Nothing wrong with Dahl there. The demos must have the exclusive opportunity to decide how matters are to be placed on the agenda of matters that are to be decided by means of the democratic process. Whilst it is possible to ensure that the decision stage is invariant wrt to different samples of the same population, this is not the case with the former. From the perspective of democratic equality, I cannot understand how sortition can possibly play an agenda-setting role (irrespective of its epistemic merits). That prerequisite is fulfilled exactly as I described, I do not get where your difficulty lies, sorry. Maybe, try to put “statistical sampling” for “sortition” to understand our triage. As you know, my original template is Athenian assembly democracy, where a) anybody could make a proposal and b) all citizens judged the merits of the proposal. In the fourth century only the final (post-deliberation) decision was arrogated to a statistical sample, all citizens still retained the right to decide which proposals to send to the nomothetic panels for deliberative scrutiny. The challenge is how to preserve those principles in large multicultural poleis. Replace: “all citizens still retained the right to decide which proposal …” with “all citizens – represented by a valid statistical sample – shall have the right to decide which proposal …”. As Yoram has pointed out, this could well be 1,000 proposals a day and there is no obvious mechanism to ensure a selection that would be invariant across different statistical samples — the best they can do is ensure minimum epistemic standards. PS terms like “falsification” have no place in democratic discourse. Could. Even if: There is the Rule of 90-9-1. That’s your opinion. My opinion is that falsification is key to improve discovery of collectively desirable human actions. PS: Keith, I get a sense from the undertones that this is becoming an unfruitful debate and I ma quite busy. So thanks, speak another time, maybe. regarding your voting method… like all voting methods this one has flaws. I worry when people believe their voting method is great. The method you describe is highly prone to manipulation by insincere tactical voting. As Borda said about his method, “My method is made for honest men!” but it doesn’t work out well in the real world of high stakes elections. Without going too deep down the rabbit hole of social choice theory and voting criteria, here is a thumbnail description of the problem with relying on which choice gets the fewest “no” votes. If some voters vote sincerely, they are disadvantaged compared to insincere tactical voters. The point is, that even the most elegant mathematically perfect voting method can fail when human psychology is factored in. Like straight Approval Voting, this method will tend to devolve to tactical Plurality Voting when voters care about the outcome. Hi Terry. here is the game-theoretical logic. The proponents of a proposal are not allowed to vote, we are looking at independent random voters. 1. If your theoretical first voter existed, there would not be a “Can live with” vote if one of the alternatives has his Yes vote. That is clearly not the case looking at our data. People use all three options all the time. 2. It is perfectly legitimate for somebody to like one alternative so s/he cannot live with any other. The objective distinction between the three votes is that in one I support it or detract actively, and in the third I remain passive, whatever happens. 3. We are seeking to IMPROVE on majority voting. I’d be highly suspicious of anybody claiming to have the perfect system.You will also see that I claimed no such thing as a perfect voting system. I said “we use it”. Can you be reasonably more specific? How many triage committees? How big would each committee be? Would this be a full time job for the members of the committee for the duration of service? How long would the committee examine each proposal? Would there be a discussion, or would each committee member decide on their own? How would the relevant information be collected? If expert opinion is of interest, who would decide which experts are invited? >> How many triage committees? Triage is infinite, as it is soft sampling. >>How big would each committee be? Enough for a 99% confidence in ranking validity..(1% Error = wasted citizen parliament expense increment). >>How long would the committee examine each proposal? >>Would there be a discussion, or would each committee member decide on their own? >> How would the relevant information be collected? Innovator provides proposal information, Citizens crowdsource additional information appropriate to each stage decision. >>If expert opinion is of interest, who would decide which experts are invited? This is an online debate, no such decision is needed. An expert wants to weigh in, he can. I don’t know if this is deliberate, but it certainly seems like you are avoiding providing many details. > Innovator provides proposal information, Citizens crowdsource additional information appropriate to each stage decision. Seems like this would give a huge advantage to those with the resources and status required for creating polished, authoritative-looking presentations. > An expert wants to weigh in, he can. Again, this gives a huge advantage to those who can recruit prestigious experts to promote their proposals. >> a huge advantage to those … creating polished, authoritative-looking presentations. Quite possible. My thinking is, that i see this polished thing also in sStartups, and still we are progressing, so all in all I am not too worried if this repeats in policy matters. Plus, once an idea has reached proposal stage, there is bound to be more support and helpers. >>can recruit prestigious experts to promote their proposals. Since Per Norbäck’s DemoEx we know that name and prestige must not enter. So its does not require a genius to design the online format accordingly. Well, you seem to be unrealistically optimistic to me. To me it seems very important to avoid such wishful thinking. You may be right. Sadly, only optimists are dumb enough to venture out to do something new instead of wisely talking about the possibility of it. I disagree. Realistic analysis is the precusor of effective action. Especially in the area of democratic governance. We’ve been stuck with oligarchical systems pretending to be democratic for about 200 years now. Many well-meaning attempts at reform have failed due to unwillingness to recognize the fact that much of our intuition about democratic governance turns out to be incorrect, and only careful analysis can lead to meaningful reform. Would you say that startups “creating polished, authoritative-looking presentations” have a better chance of getting their proposals approved and financed than ones that don’t? Why then does progress and innovation not come from the big powerful corporates with far “more resources and status” which you said gives them a worrisome advantage for this? The problem is not just corporate power, but that policy proposals should reflect the beliefs and preferences of the majority of citizens (or a significant minority). That’s what the word “democracy” means. What I find unlikely is the procedure that you are suggesting – a large number of panels sifting through a huge stream of policy proposals – would lead to adopting policy that would benefit the public at large. I thought you were a young guy (at least relative to myself), but I’m not sure how distinguished you are! Seriously though, I agree with Yoram that sortition proposals need to be designed very carefully in order not to discredit the procedure. No worries, I am not distinguished at all. I thought Yoram is. However, “careful design” is of course not to be disputed, other than a flat “impossible”. My experience with design is that it is rarely right first time, only in trying it can be perfected iteratively. Which is a good reason to stop talking once it goes in circles (like here) and start doing. Yes that’s true, but we have to be sure what we are aiming for — a democratic system or one that generates “good” epistemic outcomes (whatever that means). Isn’t the goal to have both? the very REASON for favoring democracy is the belief that, over time, the self-correcting nature of feedback will lead the demos to make epistemically good (or at least not predominantly terrible) decisions. All known other forms of government tend to deliver bad decisions (from the perspective of the general population). The Chinese experiment hasn’t finished playing out, but I believe ultimately will be lumped in the bad decisions category. If one thinks democracy is likely to generally deliver epistemically bad decisions, wouldn’t one abandon support for democracy? While it’s always nice to have your cake and eat it, democracy means that the people have power and this is generally taken as an argument for political equality. I happen to agree with you that the cognitive diversity generated by democracy can lead to better outcomes from an epistemic point of view but this is a contingent benefit. The examples that Helene provides in her book for the epistemic benefits of democracy are underwhelming as the cognitive diversity could be better provided by non-democratic means. If you want to get out of a maze and this requires geographic and cryptographic skills (to decode the inscriptions on the wall), you would be much better off recruiting people with these skills than drawing names from a hat. Whilst its true that general-purpose legislative assemblies can never know in advance what skills are required, that’s an argument against general purpose assemblies — a relic from the time when you had to choose a representative and send him off on his horse to some distant place to parley on behalf of his constituents. At very best it’s an argument for stratified sortition, something that neither of us agree with. Whatever the possible epistemic benefits of cognitive diversity it is a serious mistake to use terms like “falsification” in a discussion on democracy. That’s why Urbinati describes the epistemic turn as one of the disfigurations of democratic theory.